Last week, I wrote about my queasy venture into acupuncture for my stupid slow to heal left hand. Remember, those of you who are new to Blue Speckled Pup, I am seeing a licensed physiotherapist for treatment, not poking myself with sewing needles and barbeque forks at the kitchen table. Still, the idea of sitting with needles stuck in my paw for fifteen minutes at a time makes me lightheaded and starts an off-tempo cha-cha in my digestive tract. I can’t help it. Needles terrify me. Last week, I wrote about trying to focus on things other than the needles. I looked away while my therapist tapped them into place. I took a dizzy photo for the blog and then busied myself with my Kobo. No matter what I did in my attempts at distraction, I could see my pincushion hand in the periphery of my vision; I fought the whole time to stay calm and vertical. Based on my “soothing” breaths, I’m quite sure the people behind the curtains in other treatment rooms thought I was in the early stages of labour or the last stages of emphysema. Shame on me for cracking that joke. Yes, I am well aware there is nothing funny about emphysema. There’s also nothing funny about needles, but we’re trying to rock the black humour here. My hand is under there, full of needles. My physiotherapist laughed like mad at me when I hauled my bowl into the clinic. So did all her physiotherapist friends; this is just further proof that people who stick needles in other people have twisted senses of humour. Today, with my magical not-quite-Tupperware salad bowl upside down over the scene of the crime, I was able to relax and allow the acupuncture to work away at my hand. I learned that I can’t read while I have this procedure–proven when I restarted the ebook I read during last session later on and asked myself questions like, “When did that happen?” and “Who the heck is that chick?” This week I just sat at the tiny table with my plastic bowl and played Angry Birds. Launching furious fowl at stuff (particularly the birds that literally explode with rage) is enough to distract a person from just about anything. Sneak a smart phone along to your next pap smear and try to prove me wrong. Strange things started happening under the bowl this afternoon. My hand tingled. All my digits flushed with heat that quickly spread to my whole hand and partly up my forearm. (I desperately wanted to use the word “phlanges” in that last sentences, but I am a model of restraint.) Truly, I felt like I had trapped my hand in a not-quite-Tupperware sauna, and the sensation was remarkably soothing. My physiotherapist mentioned two things about the intense heat and tingling: first, the sensations meant my “Chi” was flowing like mad, and also, my circulation was working overtime to address the injury. Whatever, physiowoman. If I can’t see it, it’s not happening. There are no needles: just a big, blue bowl of healing. LOL. I’d say you are pretty creative; whatever works right? Oh man, Alice, I don’t know how you survived that childhood. I would have run away to live in the woods, eating squirrels and moss until I was the age of majority. You are so clever! Necessity is the mother of invention, isn’t it? 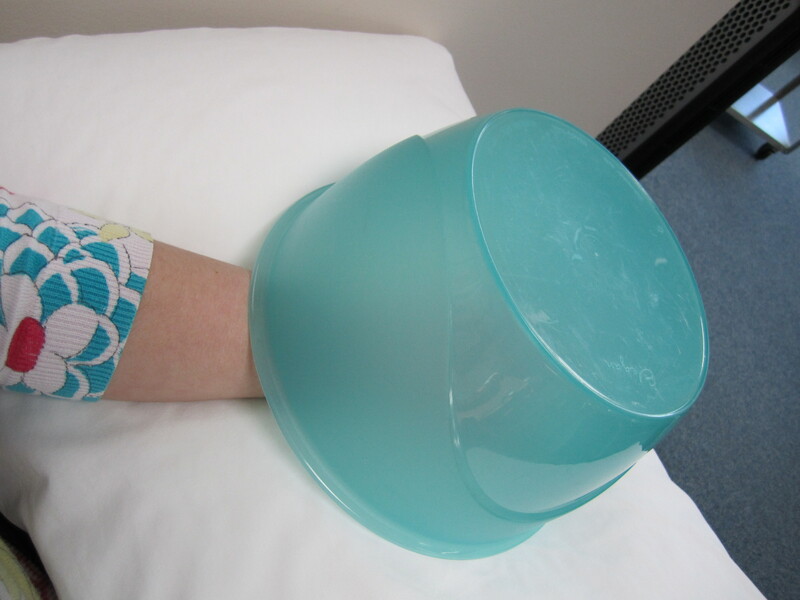 That’s not a bowl on your hand; it’s the Acupuncture Tent! Puncture? There’s no puncture under there. Kay, I love you girl! You are one creative lady! Who would’ve thunk a blue, not quite Tupperware bowl would bring you so much comfort. (did you like my horrible grammar?) That was specifically for you! 🙂 I am glad the needles are working. So far, so good with the needles Carol, and thanks for the good wishes. Not-quite-Tupperware is much better than the real deal: all the efficacy and none of the snobbish attitude! I love your ingenuity, Kay! Good for you for always finding solutions to assist you! Thanks, Cinderella. It was a survival tactic with the bowl. Plus, it is always useful to apply my shenanigans to blogging. My life is really to ridiculous to not be in print. That’s a great way to avoid it – i’m the same way with needles – and most things medical, unfortunately. I’ll donate blood, but at no point will I ever see the needle in my arm, or the little baggie filling up. I hope it works for you, so that your wrists stop bothering you! Thanks! I am hopeful, because apparently cortisone shots might be the next step. Shudder. I can’t even imagine donating blood; I get queasy even thinking about it.